Infinite Journey / In this together... is een dansvoorstelling waarin de choreografische structuur wordt gedragen door ‘de oerdrieklank’. De basiskleuren en -vormen zijn het vertrekpunt van een abstracte en absurde evolutietheorie. Eveline Van Bauwel bouwt in dit stuk een brug tussen dans en technologie en vormt hiermee een kruisbestuivend en constant transformerend organisme op scène. Alles staat in verbinding met elkaar, in zichtbare en onzichtbare systemen. Muzikaal speelt een ‘Platenballet’: een complex systeem van ‘loops’ en ‘phase shifting’. De installatie van platenspelers is een visuele en akoestisch-poëtische ontmoeting van het verleden en het heden ergens in een gat in de tijd. De voorstelling brengt bij de toeschouwers de verbinding tussen kleur, beweging en muziek naar de oppervlakte van het bewustzijn. Geïnspireerd door de synesthesie en gebaseerd op de kleurenleer van Johannes Itten en Kandinsky zou je dit een hedendaags, uitgepuurd en vereenvoudigd Bauhaus ballet kunnen noemen. ‘Infinite Journey / In this together...’ is a dance performance in which the choreographic structure is carried by the “primaeval triadic chord”. The basic colours and shapes are the starting point for an abstract and absurd evolution theory. 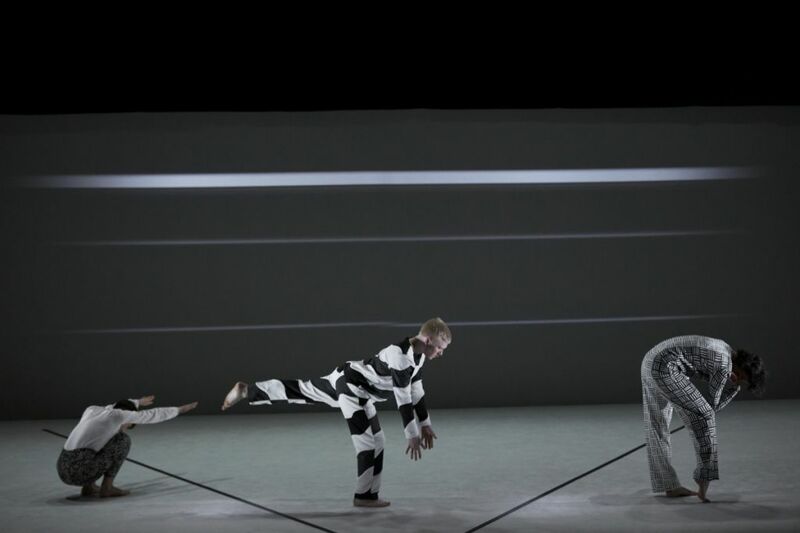 In this piece Eveline Van Bauwel builds a bridge between dance and technology to form a cross pollinating and constantly transforming organism on stage. All is connected in visible and invisible systems. Musically a record player ballet produces a complex variation of loops that are phase shifting. The installation of record players is a visual and acoustic-poetic meeting of the past and the present somewhere in a hole in time. This performance for three dancers brings the connection between colour, movement and sound to the surface of consciousness. Inspired by synesthesia and based on the colour theories of Johannes Itten and Kandinsky you could call this a contemporary, distilled and simplified Bauhaus Ballet. Eveline Van Bauwel (°78, Borgerhout) graduated at the Royal Ballet school of Antwerp in 1996 and danced at the Volksoper Wien. In 2003 she started working freelance with a.o. Liz King and Elio Gervasi and Marc Thompkins moved to Belgium again in 2004, where she worked with a.o. Jan Fabre, Kris Verdonck, Heike Langsdorf, the PONI collective and Geert Vaes. Since 2006 she’s also a Yoga teacher. In 2012 she started her own creations with a solo Infinite Journey / Two Autumns and I have not changed enough. Now she presents the première of her new work Infinie Journey.. at Monty.